It is becoming ever more apparent these days, as the commercialization, marketing and pageantry of Christmas increases; principal religious elements associated with the day continually diminish, seemingly consigned as remnants of bygone eras. Christmas and the Christmas season have become the impetus behind many annual marketing campaigns, with which ad agencies often integrate secular advertising themes and catchy slogans, all aimed at improving year-end sales numbers for retail enterprises. Mention of Jesus or narratives of the babe in the manger are heard less and less, while Christmas indulgence is promoted. Christmas is becoming not so much about the Christ-child, as it is a time of celebration, frivolity, parties, gift giving, gift getting, good cheer and of course food and alcohol. The universally recognized Christmas manger scene with Joseph, Mary and the babe, with shepherds, the three wise men and the Bethlehem star has been constrained to church property and the front yards of private homes scattered across the land. Public buildings, US Federal as well as state and local government facilities are now strongly encouraged to keep any religious themed displays of Christmas off public property. 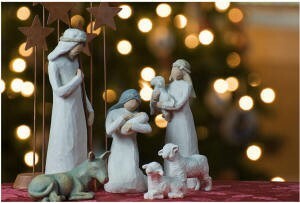 A Santa Claus figurine or window decoration, a candy cane, silver bells, a snowman, holly wreaths, a Christmas tree or brightly shining lights; all these are OK to display, but not the babe in a manger. It is obvious that Jesus is being systematically removed from the holiday; that Christ is being eliminated from Christmas. And that’s not such a bad thing! The annual war on Christmas brings out the lunacy of the warriors, as witnessed with the recent Starbucks Red Cup Controversy. How crazy! If only the proponents of this confrontation would simply read their Bibles and be honest with history, they would be able to see just how pitiful it is mixing Jesus Christ with pagan festivals and heathen religious practices. A courageous look into history, especially religious documents and Catholic Church history, along with an honest reading of the Bible will reinforce the fact that Christmas is not one of God’s holy days, nor is it sanctioned by God. Christmas is an amalgamation of pagan celebrations, heathen religious practices and folklore, which borrows from the Nativity narrative. That Jesus Christ was born on December 25 is both historically and scripturally unfounded and a fabricated lie. There is ample evidence exposing the truth that Jesus Christ was born in the fall, in September, on the first day of the Feast of Tabernacles. However, few pay attention to the details these days. The truth of Christmas is not a mystery tucked away on a shelf somewhere in the hidden recesses of the lower level of a book depository. The truth is available for anyone who seeks it. However, replacing error with the truth is a painful exercise, indeed! No pain, no gain! With Christmas comes Christmas carols. Joy to the World, Hark the Herald Angels Sing, Silent Night, Away in a Manger, O Little Town of Bethlehem, We Three Kings of Orient Are, The First Noel. These traditional melodies distinctly emphasize the religious elements affiliated with Christmas. Moving along in time, arriving in the 20th century, religious themes of the nativity and of Jesus were submerged by modern classic tunes such as Silver Bells, Blue Christmas, Winter Wonderland, White Christmas, It’s the Most Wonderful Time of the Year, It’s Beginning to Look a Lot Like Christmas, Holly Jolly Christmas and Santa Claus is Coming to Town. Many of these tunes are used as commercial jingles to advertise this or that product. Most of these modern compositions and many more emphasize seasonal merriment with little or no mention of Jesus Christ. Of course, and again, that is not such a bad thing. Once again, truth reveals to us there is no authentic or factual association between the realities specific to the birth of Jesus Christ and Christmas. The religious elements commonly associated with Christmas are manmade machinations, manipulations, whimsical and farcical. In the face of all this fiction is a magnificent reality, the magnitude of which is cosmetically concealed by this annual modern-day saturnalia celebration called Christmas. The significance of this reality … “For unto you is born this day in the city of David a Savior which is Christ the Lord” (Luke 2:11) … has been grossly obscured and veiled for centuries and certainly still is today, not only to the world but also to most Christians. How foreign it is for many people these days to truly comprehend the actuality that Jesus Christ was born, not to remain the babe in the manger, but rather to become the Savior of humanity, the Redeemer of creation and as God, King over all this world. Jesus Christ grew out of the manger. He grew up, becoming a man, learning through his sufferings and remaining perfect, from His birth to maturity. He walked the earth as a man in order to appreciate what it was like to be human, to live in the flesh, to suffer and die in the flesh. He learned what it was like to experience joy, suffering and sorrow. He lived life in the flesh in order to have complete empathy for mankind. As the scriptures teach: “Forasmuch then as the children are partakers of flesh and blood, he also himself took part of the same … for verily he took not on him the nature of angels but he took on him the seed of Abraham. Wherefore in all things it behooved him to be made like unto his brethren, that he might be a merciful and faithful high priest in things pertaining to God, to make reconciliation for the sins of the people. For in that he himself hath suffered being tempted (yet never sinning (cf. Hebrews 4:15)), he is able to comfort them that are tempted” (Hebrews 2:14-18). Additionally, “though he were a Son, yet learned he obedience by the things which he suffered; and being made perfect, he became the author of eternal salvation unto them that obey him” (Hebrews 5:8-9). The Apostle John wrote of Christ: he, from the beginning, was the Word. Jesus Christ was God and was with God (the member of the God family who is God the Father) from the beginning. He was made flesh and he dwelt among men (John 1:1-14). Regarding the birth of Christ, we are told that Joseph and Mary would call his name Jesus (Matthew 1:21). Jesus is an anglicized name translated from the Greek Iesous, which was transliterated from the Hebrew/Aramaic Yahshua. Christ’s name revealed who he is and what he came to do. Yahshua, a compound word from Yah Oshua means I Am salvation, or I Am the Savior. And indeed, as the scriptures reveal, “he shall save his people from their sins,” Jesus Christ is the Savior. The God of Israel, Jesus Christ spoke saying, “for I am the Eternal (Yahweh) your God, the Holy One of Israel, thy Savior” (Isaiah 43:3). The God of the Old Testament, the God of Israel was born in the city of David as a physical human being and he became the one who is the Savior, Christ the Lord (Matthew 1:21). As the Savior, Jesus Christ will save humanity (of course, those who want to be saved) from their sins (by His sacrifice and death) and from eternal damnation (if they obey Him). As Christ, Jesus is the Messiah, the Anointed One of the Father; anointed to be King. As Lord, Jesus Christ is the I Am, Yahweh of the Old Testament. There are still more magnificent truths, which are obscured by the commotions of Christmas. Mary, the mother of Jesus Christ was told she will “bring forth a son and shall call his name Jesus. He shall be great and shall be called the Son of the Highest: and the Lord God shall give unto him the throne of his father David: and he shall reign over the house of Jacob forever; and of his kingdom there shall be no end” (Luke 1:31-33). There are two elements of this prophecy surrounding the birth of Christ that have yet to become a reality, but both will, in the near future. Jesus Christ has yet to sit on the physical throne of the House of Judah, the throne given to David and his progeny that followed. Jesus Christ will sit on the throne of David when David’s throne resides in Jerusalem at the second coming, the return of Jesus Christ to this earth. Jesus Christ has yet to reign, to rule as a King over the House of Jacob (the Children of Israel). The time is fast approaching when Jesus Christ will rule a government, called the Kingdom of God, over the living, modern-day, 21st century descendants of Israel and over all nations extant at that time. The Bible clearly reveals that Jesus Christ, who is the Eternal God of Israel, will rule a government on this earth, which will be a worldwide government. When that time becomes a reality, all governments of man will be removed. All religions of man will be eliminated. No longer will there be corruption, scandal, disrespect, bigotry, bias, deception and dishonesty of elected officials and public servants. No longer will there be dictators of any form, elected officials of any ilk, or government institutions acting as fronts for corruption, disrespectful of human life, disrespectful of race and color, abusive in behavior, tyrants and oppressors. The babe in the manger grew up long ago, growing out of his “crib,” maturing into the only human worthy of all honor and worship, qualified as a Savior, competent to sit as a King and God of all humanity. Jesus Christ has qualified to take care of His Father’s business, to bring about a world of peace, prosperity and soundness; a true and only one world government. The Christmas theme of the babe in the manger freezes Jesus Christ there, suspending him forever as a babe. However, nothing could be further from the truth. The magnificent truth is, Jesus Christ is no longer a babe. He is God. He is the Savior and He is King!